Have you seen our latest In Colors ? I know many people are saying that some of them are very similar to some colors we already have. But there are slight shading differences and that will be very handy for some stamping techniques. Today I am not using the shading, but I am using some of the new In Colors. 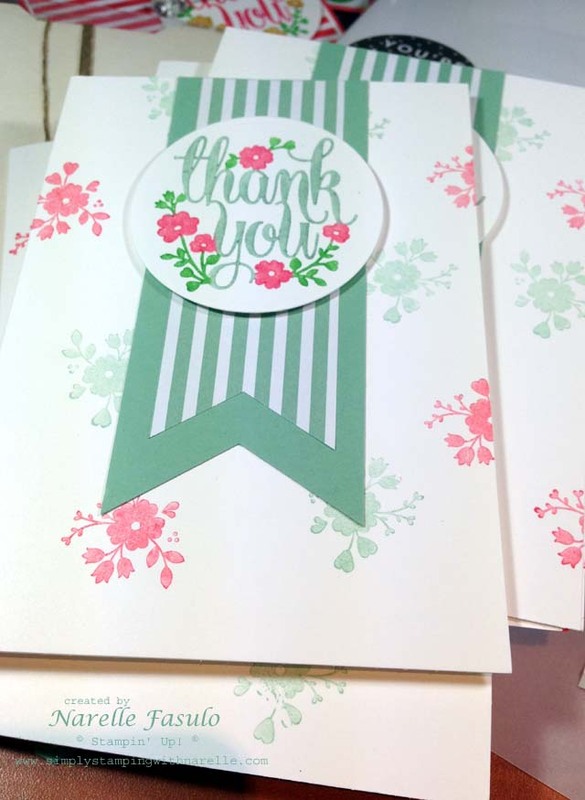 Here are some thank you cards that I made last night, or should I say, in the wee small hours of this morning...oops. Sorry that will also explain the dodgy photo. They are all in envelopes now just waiting for me to head to the post office, so I can't take another photo. I used the gorgeous Mint Macaron and Watermelon Wonder and just a touch of Cucumber Crush. The stamp was coloured using the new In Color Stampin' Write Markers. That is such a fun technique. I have also used the new Envelope Paper for the smaller banner, which of course was so easily made using the new Triple Banner Punch. And when you have to mass produce a card, tools like this new banner punch make the job a whole lot easier. Last but not least, that gorgeous stamp. It is from the Whole Lot of Lovely set which is a Stampin' Rewards only set. To be able to get this set, you need to either host a party or put in an order to a qualifying amount. If you would like more information on how to get a hold of this stunning set, then make sure you contact me. I hope you like this card. 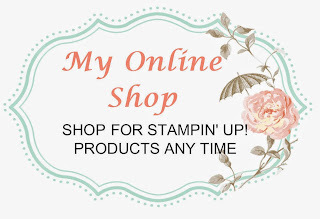 As always, if you need any supplies at all, please visit my online shop.